Who can stop and laugh at a good humorous welcome mat when it greets you at someone's door step. This funny doormat is no exception and reads "Y'all Come Back now, ya hear?" This will bring a smile to any guests face and will help to brighten the spirits of your guests when they read this doormat. In additions a humorous welcome mat is a great way to break the ice and get your guests talking before you can even let them into your home. 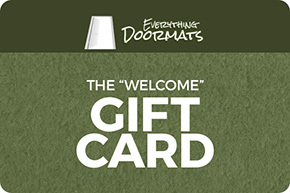 This ?Y'all Come Back" doormat is made from 100% Olefin Indoor/Outdoor carpet. Olefin is a strong durable synthetic material that is extremely stain and chemical resistant compared to nylon. Since it is a synthetic material it is manufactured to be extremely resistant to mildew and moisture-related damage and contaminants since it has a low absorption rate. In addition a ?Y'all Come Back" doormat has perfectly bound stitched edges and is manufactured here in the USA. By using bound stitched edges this helps the mat to last from year to year as the edges will not unravel.